I've been thinking that our dog, Daisy, needs a little companion. I asked my husband what he thought about getting a puppy. I expected a giant snort and overdramatic rolling of the eyes, but the guy surprised me when he shrugged his shoulders and said, "Sure." 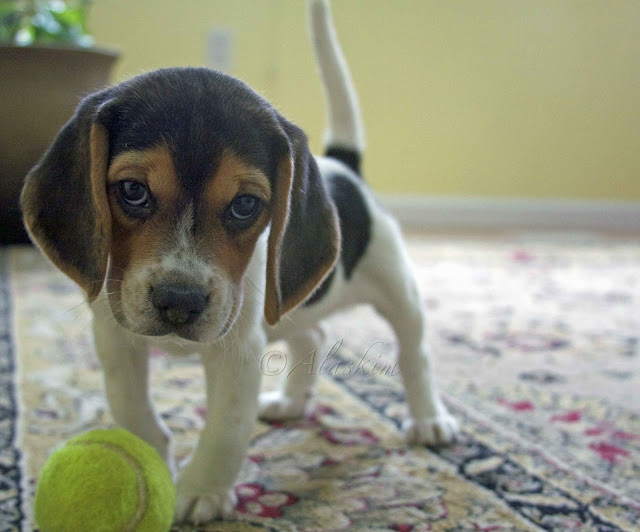 An 8-week-old beagle puppy is just about the cutest thing on earth. refuses to acknowledge Lupine's pleas to play with her. 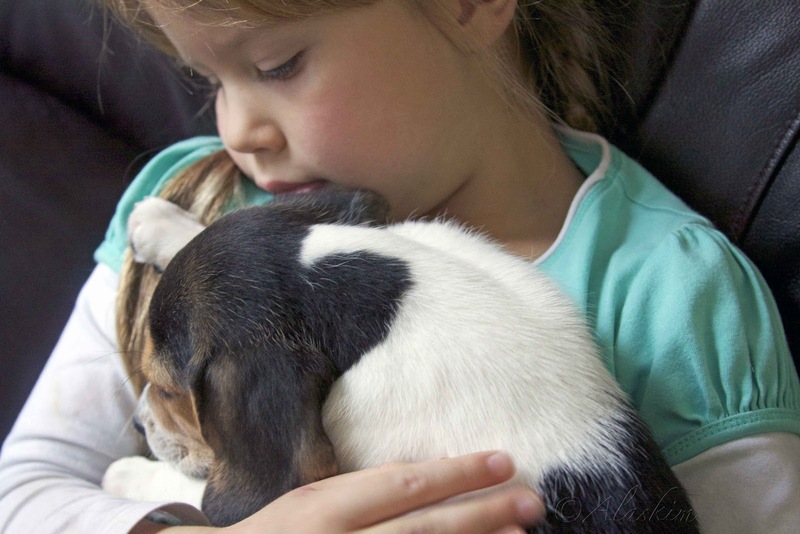 Dog babies are a lot like human babies; they mostly eat, sleep, and poop. Unlike human babies, however, puppies are born with little teeth that they like to sharpen on my earlobes. Our new puppy doesn't nip anybody else's ears—just mine. What's up with that? I am a fragrant flower. Or possibly an aromatic dog biscuit. So far, Lupine has not had to sleep by herself. The girls are on Spring Break from school, so Little Baby Lupine can nap throughout the day on various family members. She likes to snuggle up against our warm throats, which sounds vaguely menacing, but is actually quite sweet. She fits nicely in the cozy space between our chin and chest, and is lulled to sleep by our heartbeats. My 11-year-old daughter can't bear to hear Lupine whimper in her crate at night and keeps sneaking the little dog into her bed to slumber peacefully next to her. This puppy is spoiled rotten, is what I'm trying to say. The puppy is very sweet! How did you come up with the name Lupine? Mexican Lasagna??? That sounds good! You should post your recipes! You're a very funny and wonderful writter but I have to admit my favorite part is seeing what you had for dinner. I think that makes me sound really weird and slightly creepy.....really I'm "normal" I just always need dinner inspiration! And the puppy?? So adorable! Mundanemomma: "Lupine" is a purple wildflower that grows everywhere up here, and we thought it went along well with "Daisy," which also grows wild in our area. On a play of words, "lupin" is also characteristic of wolves, which we find funny because beagles are so opposite of ferocious! Jammie Girl (hi, Angie! ): I figured a puppy would be safer than having another baby, although after all the little poopies I've been cleaning up, I should just go ahead and put the dog in a diaper! I promise I won't start breastfeeding. *awkward pause* I've gone too far, haven't I? Michelle, here's the recipe: Mexican Lasagna. The first time I ever ate it was right after I'd had the twins and a friend brought it over for our family. Yummy! This makes me want a puppy so much! She is darling. I understand spoiled puppies! I regretted getting ours for about 2 years (the time it took her to not be a puppy anymore). But the girls love her so much and how can that be bad?? What a sweet little face! Congratulations on the new addition! What a gorgeous puppy.. We got our one two years ago, and we already had a very ancient collie who was almost 19 years old.. The little puppy keopt trying to make Sasha play with her, but she ignored her the first 4 weeks completely./. it was very funny to watch, then she allowed Millie to play a little with her, snipping her when it was too boisterous.. Sadly she left us after 6 months due to her great age, then Millie was on her own.. We did the maddest thing and got another puppy who was by this time the same age of 1 year.. Fun and havoc wreaked, but we would not change them for the world... I am sure your two will work out the same and I look forward to hearing about all their adventures.. your little ones are very lucky!! Adorable! We had a dog who would not accept the new puppy. Actually she never did accept her. Have fun with that cutie pie.